Third grade is really right on the cusp of early elementary and later elementary. Therefore, while children are starting to increase the number of words they can read and move away from picture books, they still have certain educational values at this level. 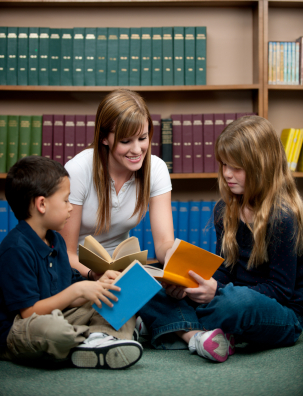 There are several ways that picture books can be a key focus in a lesson plan. Prepared picture books can be used as a focus point to explain the parts of a story - the beginning, the middle and the end. Students can also create their own picture books to illustrate stories. Here are some suggestions on how to use these ideas in your classroom. Ask students to use pictures for sequencing purposes. Have students create their own picture book. Introduce students to the importance of imagery. Guide students to use pictures to help develop the main idea. Employ picture books as a tool for struggling readers. Provide a story without words or pictures, and assign students to create the missing element. Figuring out what happens next in a story is helpful for understanding the elements of foreshadowing which often appear earlier on. However, "foreshadowing" is a bit of a hefty word for third graders. Read a picture book out loud to students, and ask them to guess what is going to happen in the following pages based upon the pictures they see. Here we have a project that might last for a few weeks or for an entire quarter, depending upon how in depth of a creation you want. Writing a regular book is going to be overwhelming for this age group. Therefore, ask them to create a picture book about an assigned topic, such as a favorite pet or best memory from vacation. Read the same book twice, once with showing the pictures and once without. If you're going to read it without the pictures first, ask the students to envision what images the author had in mind before showing the students. If you're going to read it with the pictures first, you can ask the students what they need to do for themselves when there are no pictures. Figuring out the main idea of an entire work can be challenging. Teach students to turn to illustrations for help. Are certain colors or shapes used over and over again? What are the emotions on the character's faces? How are certain characters drawn in comparison to other characters? Perhaps you have some students who have learning disabilities or who simply cannot read at the same level as the other third graders at this point. Include both picture and non-picture books in your classroom library, so that students have different varieties to select from. Encourage struggling readers to start with more basic books, such as the picture books, in order to help build vocabulary and learn about the structure of such works. Students should learn what the connection is between the written word and the picture in order to help them later on when they have to understand the connection between the written word and the image that they create in their mind. Hand a series of pictures out to them and ask them to add a story line to these illustrations, or give them a written story and ask them to draw illustrations to go along with it. You could divide the class up into groups for this project and each student could be responsible for a different segment of the story. "What Are Third Grade Lessons Using Picture Books?." YourDictionary, n.d. Web. 25 April 2019. <https://education.yourdictionary.com/for-teachers/what-are-third-grade-lessons-using-picture-books.html>.